Travelers trying to get from Bath to Bristol or vice versa have invariably run into a closed road and a detour that is all of 14 miles long. That’s when go-getter Mike Watts stepped in and built a toll road that is closing in on 150,000 cars served. The following video from Tom Scott was posted to YouTube and profiles a peculiar solution to a familiar problem worldwide. As the video states, Watts had workers build the road in all of 10 days, bypassing approval from the regular channels. In that sense, the toll road was built without permission. As Scott states, there was a general worry that construction of the road could hinder the very reason there is a shutdown on A431, namely a landslip that occurred in February. Watts went on with the road anyway, and it is a rousing success for the area’s infrastructure and, perhaps, a boon for roadway tourism. Watts declares that they need about 150,000 cars to break even on the enterprise—via the Bath Chronicle; Watts borrowed £150,000 against his house for the cost of construction and maintenance of five months of toll road use­­—and it has just recently welcomed its 100,000 auto across its expanse. “We have actually had people travel over the toll who have seen or heard about it in places as far away as Australia, Bahrain, Canada, The Caribbean, Turkey and Texas to name but a few. And so Watts waits for lucky number 150,000, which the report issues could come as early as November. 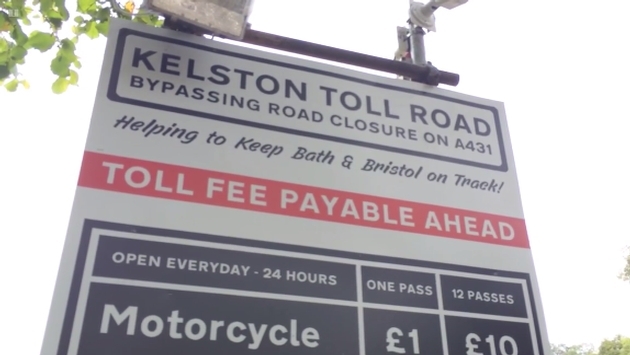 But don’t think this all means the toll road will be a permanent structure, because it is coming down once the main road is open, leaving behind a perfectly fine roadside curio for tourists. The report states that when A431 opens anew, Watts will return the road to the farming for which it is intended. So if you are in the area, stop by and experience 400 yards that seem to be all the rage between Bath and Bristol.